I have given myself permission to keep a good number of books because the organizing experts say keep what you love and what makes you happy. I love books. I'm not sure when going to the library was no longer enough for me and I started buying books. I certainly remember most all the libraries in my life and the books I checked out there. The first one with my first library card was Little House on the Prairie and of course that led to reading the whole series. Little Women, Anne of Green Gables, The Secret Garden, and Mrs. Mike were all favorites. Seems like I am recalling all girly girl books but another favorite actually was The Kid who Batted 1.000. I felt very proud that as a 4th grade girl I knew what that meant. I'm not sure we had the Scholastic Book Club sales sheets until late in elementary school. I do know my parents were generous with that and I loved going home with my stack of purchases when the books arrived. Whenever I got birthday money I spent it on books. I often still do. Then it was the Trixie Belden series and Cherry Ames. Now it is usually something related to Christian authors or Bible study. I really must allow myself to get back to the pleasure of getting lost in a good novel, just as I have allowed myself the pleasure of writing. 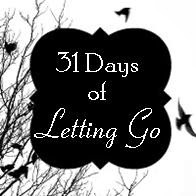 Maybe my next project will be 31 Days of Reading Anything I Want! So the bookshelf in the guest room was my challenge for the day. It looked messy. I had more books stuffed in than would fit. Photo albums took up space on the bottom shelf so first things first I decided to give them a new home. I played with what number sounded right as in "how many books will I make myself get rid of?" I thought 40 sounded good. But today I could only let go of 8. I know dusting and arranging is not the same as Letting Go, but it does look better! And remember, I gave myself permission to keep my books. If other things have to go, that's ok. But I really love my books.